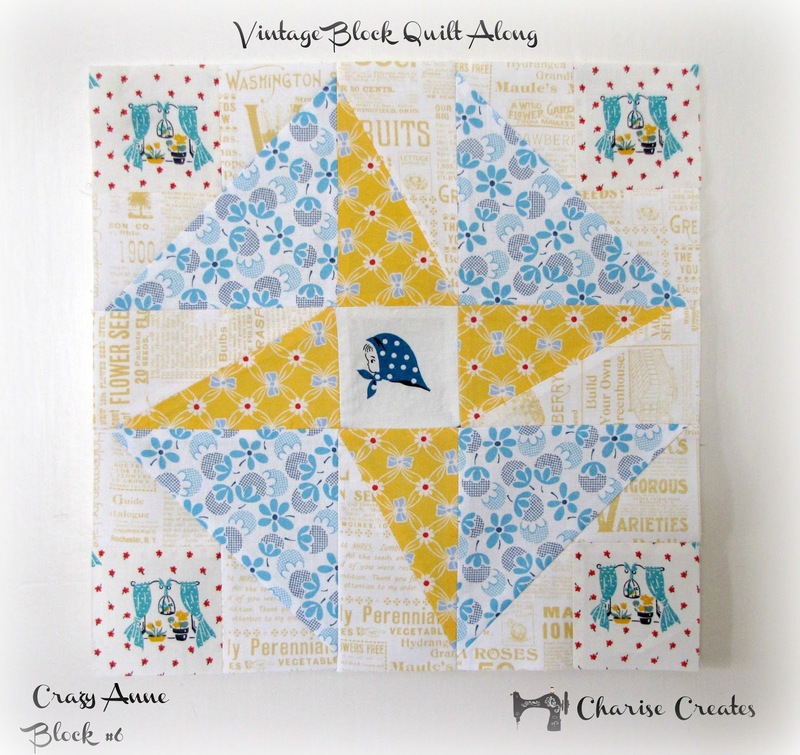 I am excited to share block #6 in the Vintage Block Quilt Along. Crazy Anne is from the Kansas City Star circa 1932. 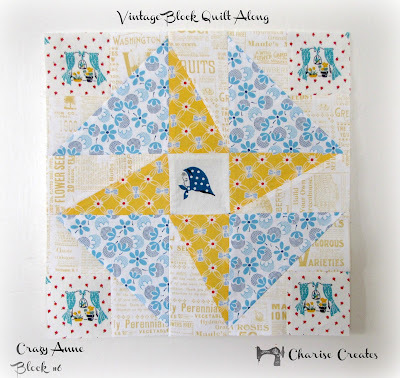 This is an easy block to make - completely rotary cut shapes - no pattern involved! *Cut all 4 - 3 1/4" x 6" rectangles in half diagonally from the left top corner to the bottom right corner. 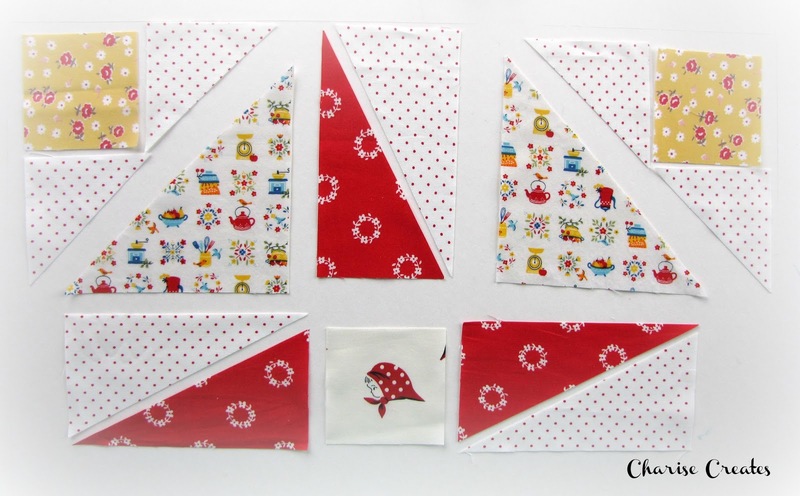 Arrange the elements of the block in the order you will be sewing it together. 1) Starting with the top row, stitch the center point unit together. Press seam open. 2) Stitch the upper left corner square to the background triangles. Press seam open. Repeat for the upper right triangle. 3) Stitch the print triangle to the upper right triangle. Press seam toward the print triangle. 1) Stitch the outside rectangles together. 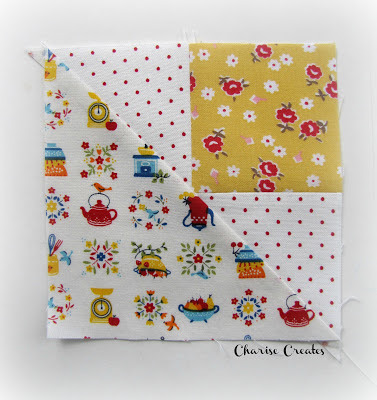 Stitch to the inside square. 2) Stitch the top/middle row to the bottom row, Press seam open. Congrats - the block is complete! I'd love to see what you make. 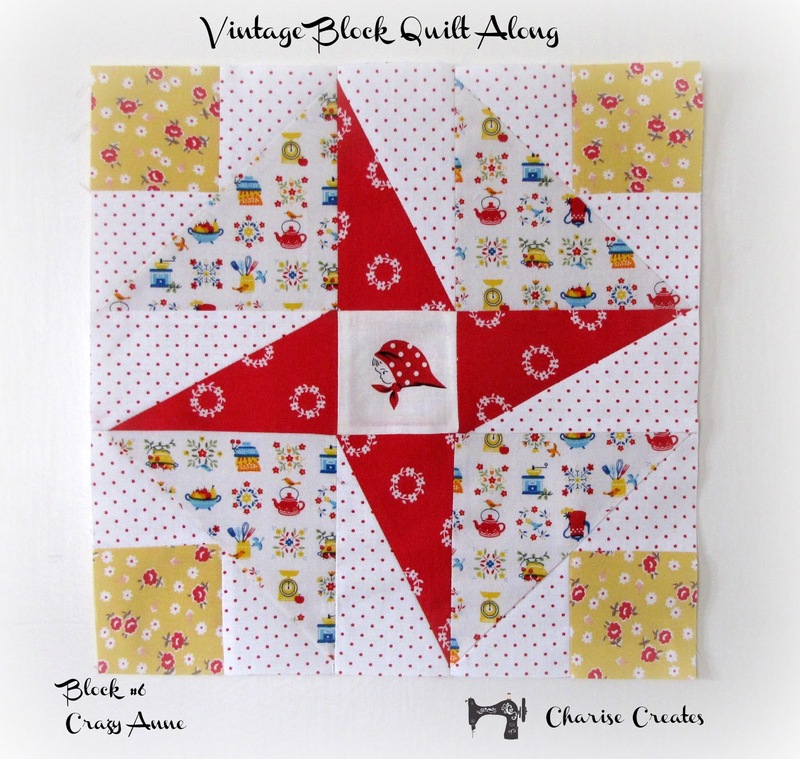 Please add your block to my Vintage Block Quilt Along Group on Flickr. 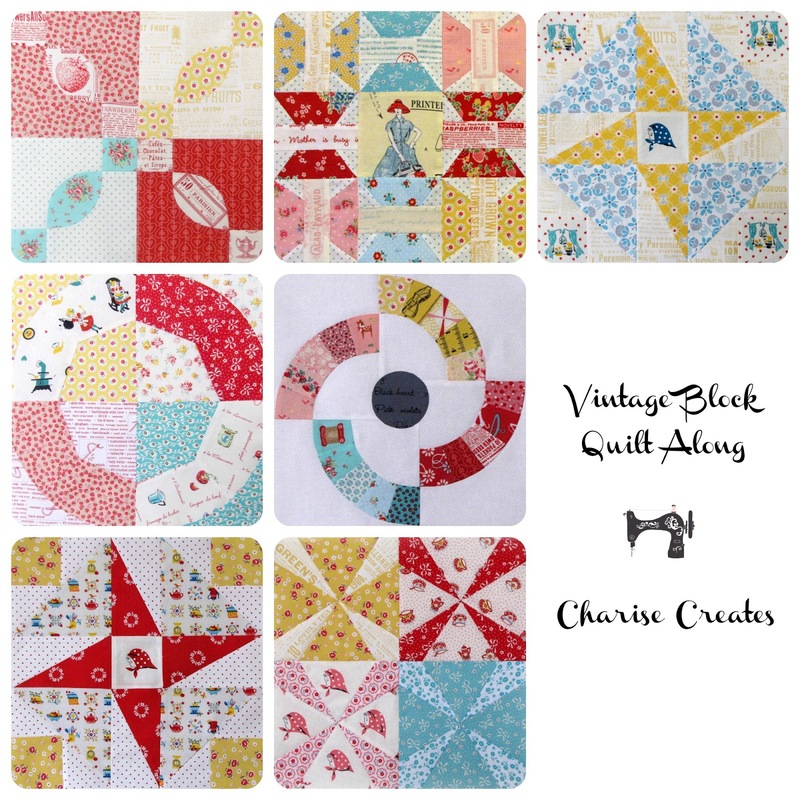 What a great block and the fabrics? Perfect! This is so beautiful!! I adore the fabrics!! 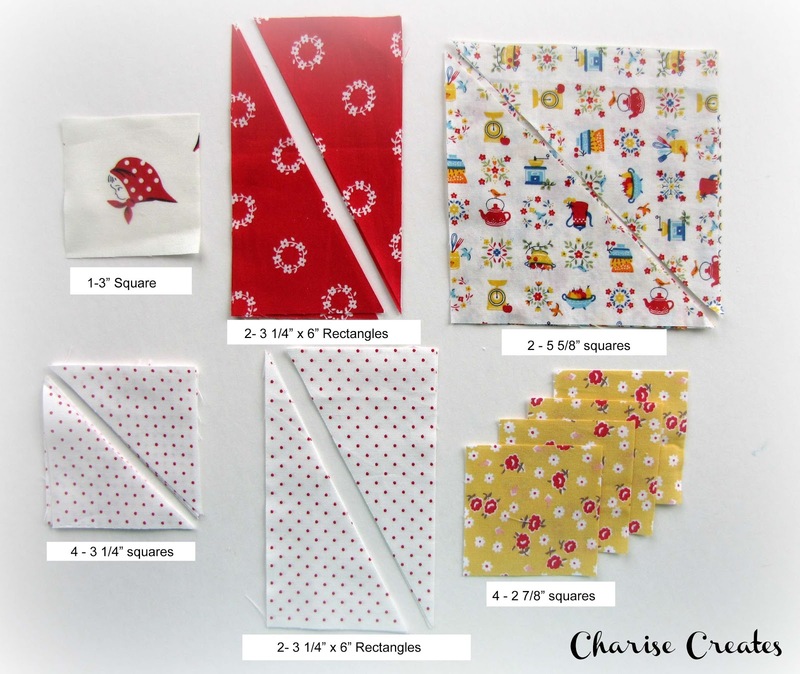 What is the adorable tiny print in the 5 5/8" squares? These fabrics in your Vintage QAL are so lovely, I feel transported. So comforting. Charise, all of these blocks are so pretty. They will be so lovely together in a quilt. I'm quite in love with that little kitchen print in your newest block. Another beautiful and unique block! Although YOUR idea of "an easy block to make" is a little different from mine... ;-) I am just learning about quilt blocks being based on grids, and have started measuring my block units as I go along to make sure my cutting and seam allowances are staying accurate. I'm looking at this block and it looks like it's a 5 x 5 grid, and each unit is 2.4"? That seems like a weird number. Is this because I'm doing it wrong? Quiltmaker Spring 2013 - Give away!